regarding your first record purchases. on this special FIRST 45's page of our FORGOTTEN HITS Website. and then check back to this page frequently to see if your entry appears! they ever bought with their own money. By 1964 when THE BEATLES hit, pretty much EVERYTHING I bought was by them!!! When I was about 4, my grandparents bought me a red and white Disney record player and a few 45s to go along ... I remember getting She Loves You and Please Please Me by The Beatles, Surfin' USA by The Beach Boys, Surf City by Jan and Dean, and How Will I Know My Love by Annette ... lol. My parents / aunts / uncles wouldn't let me play their records ... I suspect it had something to do with the fact that the record needle looked like a metal spike and tended to destroy the records in record time. I remember smuggling one of my Aunt Dorothy's records to my house ... Rhapsody In The Rain ... and playing / ruining it on my player. I was in deep trouble but it was so worth it ... I WANTED that record. My first 45s bought with my own spending money were from around 1971 ... Want Ads and One Monkey Don't Stop No Show by The Honey Cone, Chick-A-Boom by Daddy Dewdrop, Old Fashioned Love Song and Joy To The World by Three Dog Night, Never Can Say Goodbye by The Jackson 5, and Yo-Yo and One Bad Apple by The Osmonds. It was my self-designated responsibility as a 5th / 6th grader to supply our music class with the cool music on Fridays, so every Thursday I would stop by G.C.Murphy's on the way home from school and buy one new 45. I received all of The Partridge Family albums for Christmas / birthday presents. I began buying my own albums when I got into high school; first purchases were by: The Eagles, Jackson Browne, Linda Ronstadt, Dan Fogelberg, Pure Prairie League, Gino Vannelli and Steely Dan ... and The Brothers Johnson's Look Out For Number 1 ... I really loved that album! Cherricat / Mrs. K.
My first purchase was "Have I the Right" by the Honeycombs. I think I was about 11 or 12 years old. The keyboard had such a unique sound, I just had to own it. My first 45 was, I think, "I Get Around / Don't Worry Baby" by the Beach Boys. 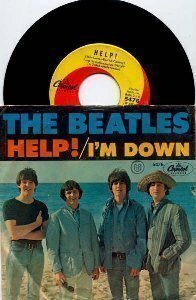 I was already into the Beatles, but didn't buy any of their 45's at first because I already had the "Meet the Beatles" and "Twist and Shout" (a Canadian Capitol release) on LP. TO THIS DAY I STILL LISTEN TO IT 2 OR 3 TIMES A WEEK AND CONSIDER IT TO BE ONE OF THE GREATEST ROCK & ROLL SONGS EVER RECORDED!!! IT WAS ONLY A MID-CHART HIT, BUT ITS GOT A HUGE BEAT, A NASTY ATTITUDE AND ITS ALL ABOUT LIVING THE ROCK & ROLL LIFE. I WAS LUCKY ENUFF TO BE AT A PARTY IN MALIBU BACK IN THE LATE 80'S, AND FOUND MYSELF TALKING TO GEORGE HARRISON, I MENTIONED THE SONG TO HIM AND HIS EYES LIT UP ... HE WENT INTO A LONG STORY ABOUT HOW MUCH HE LOVED THE SONG AND SAID HE STILL HAD A COPY OF THE 45 AT HIS HOME ... HE ALSO TOLD ME THAT WHEN HE WAS A KID ONE OF HIS OLDER FRIENDS WAS IN A BAND THAT BACKED UP EDDIE COCHRAN & GENE VINCENT ON A BRITISH TOUR, HE WOULD TELL GEORGE BACKSTAGE STORIES ABOUT HOW THE ENGLISH GROUPIES WOULD FLOCK AROUND EDDIE AND TOTALLY IGNORE A DRUNKEN GENE, WHO WOULD BEG EDDIE TO HAVE ONE OF THE GIRLS GIVE HIM JUST A PEEK AT THIER BOOBIES ..... WHICH EDDIE WOULD DO FOR HIS HORNY FRIEND. FLASH BACK TO THE PARTY IN MALIBU --- AFTER A FEW COCKTAILS, GEORGE AND I WERE SINGING A VERY LOUD, OFF KEY VERSION OF OUR FAVORITE SONG "SOMETHIN' ELSE", WHEN THE MANAGER OF TOM PETTY (TONY D.) CAME OVER TO US AND TOLD US THAT HE RECOGNIZED THE SONG, ONLY BECAUSE IT WAS ONE OF PETTY'S FAVORITES AND EARLY IN HIS CAREER THE HEARTBREAKERS WOULD PLAY IT ON STAGE ..... IT WAS ALSO RECORDED BY, LED ZEPPELIN,, SID VICOUS, SLADE & OTHERS. Yep ... 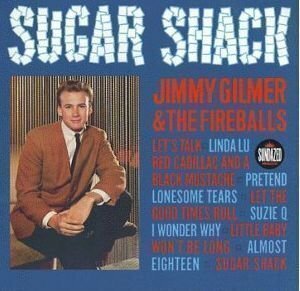 Mom had no problem with the cover and she even sorta liked "Sugar Shack". Soon thereafter, between my brother and I, we purchased hundreds of albums, some with pretty racy covers! But, Sugar Shack was our 1st. Thanks to Jimmy Gilmer choosing a suit and tie to pose in on the cover. 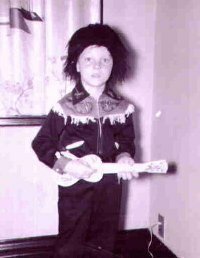 He was such a nice looking boy ... Ha! I'm replying to the "First 45" question. 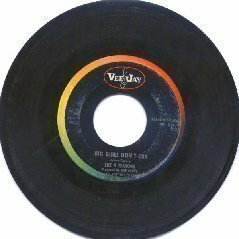 My very first 45 was given to me by a neighbor, and it was Soldier Boy by the Shirelles. Strangely enough, I couldn't remember what the B side was (which is weird, because I have a pretty good memory), but looking it up I see it was called Love is a Swingin' Thing (any chance you could highlight that for possible votes?). Anyway, as for your real question, the first record I ever bought with my own money was (surprise, surprise) I Wanna Hold Your Hand/I Saw Her Standing There. Unfortunately, back then it seems we tossed the sleeves to 45s, so although I still have that one, it's pretty scratched up (probably also from use!). Of all the things I still own from my childhood, which involved many moves during the years due to my dad being in the navy, the two things I treasure most are family pictures and my "teeny bopper" memorabilia. My box of records, scrap books, 16 magazines, pictures, Davy Jones love beads, etc. was always lovingly packed and unpacked first upon destination to make sure everything was OK.
March. 6 to 7 years old. The beginning of my lunacy! In response to the first record bought with my own money: In the early 60s, in my household there was no money for records. I don't even recall my older brother ever bringing home 45s. It wasn't until 1966 that I had enough loose change of my own to plunk down money for a 45. It probably wouldn't surprise anyone who knows me well, but that record was They're Coming To Take Me Away Ha Ha, by Napoleon XIV. 41 years later, even the funny farm doesn't want me. Mrs. Rock And Roll Never Forgets reports her first 45 was Delta Dawn, by Helen Reddy. was unfortunately warped when I played it at home and "Harper Valley PTA" by Jeannie C. Riley on the green and white Plantation label. I grew up in Rochester, NY so a lot of music I learned about thanks to TV. After Ed Sullivan had the Beatles on, they became instantly OK in my parents eyes. Yes, we watched as a family every Sunday night. I went out and bought 'I Want to Hold Your Hand' and 'She Loves You'. If they were on the Ed Sullivan Show then they had to be ok for kids according to my parents way of thinking. Soon after my grandmother who lived with us flew to NY City to visit family and she wanted to know what she could bring back for me. Gee, I think records would be great, Grandma! Beatles records even better. Sadly my aunt hadn't clue who they were so I got 'Let's Twist Again' by Chubby Checker on Parkway and this odd 45 on this Philles labels who I never heard of. My grandmother called me Eddie which is why I got a Crystals record called "I Love You Eddie". While I thought it was a generous and sweet gesture on her part, I had never heard of the record. The flip was 'He's a Rebel'. Grandma had much better taste and knew better than her grandson. She liked the B side best, she told me. My sister loved Johnny Mathis so I got her hand-me-downs. Her boyfriend got a DJ/promo 45 with his new stereo called Don't Destroy Me by Crash Craddock. I love the flip on that one, 'Boom Boom Baby'. That one literally bounced off the grooves even on my cheap record player. First album was 'Introducing the Beatles'. Great LP purchased at a record sore in downtown Rochester called Jay's Record Ranch. This coming from a city that had a gas sation called 'The El Rancho Gasateria'. Jay's ... that place was a real record store. What a great topic you've got here. Y'know, I can't remember what my first 45 was. My mother discouraged me from buying 45s because she thought they were a waste of money when you could buy an LP. However, she also discouraged me from buying LPs because she felt THAT was a waste of money when you could listen to music for free on the radio. However, with that said, there was always music playing in the house. The oldies station was always on and my mother was always singing along. Yet, we had a popsicle box of 45s, mainly garage sale finds and my mother's sisters cast offs, under the bathroom sink of all places, and I'd spend hours and hours listening to them. Now I am of a different generation from a lot of your readers, and this was in the 1980s, so these cast of 45s were really the opening of my love for music. I would, however, like to share my favorite memory of listening to 45s with my mother. When I got to be about 12 or 13, like most teenage boys, I became a moody teen with a chip on my shoulder who spent a lot of time in his bedroom alone. Also, by this time, I had aquired a very large and extensive record collection and I had the only working record player in the house (this is during the days of the cassette revolution). Anyhow, one Saturday as I was reading comics my mother barged into my room to my annoyance with a box full of 45s that she had bought at a garage sale. I just wanted to be alone and I knew that there wasn't going to be any Doors or Beatles of Rolling Stones amongst them. However, my mother was always the bold type and she began pulling them out and slapping them on the turntable much to my bad attitude and protests. I think she had some Lesley Gore and Herman's Hermits and Freddie Cannon and whatever. That kind of stuff. Nothing that, at the time, really thrilled me Suddenly she laid the needle on "My Mammy" by the Happenings. I'm not sure if it was a B side or what it was (I've never heard the song outside of the record). Anyhow, the song was absolutely TERRIBLE. Both me and my mother hated it immediately, but somehow, the look of repulsion on my mothers face just killed me! I mean, I didn't have much of a sense of humour at that time, but I just started laughing uncontrollably. My mother tried to turn it off, but I stopped her. Jumping off my bed I listened to the whole song, and then made her play it again as I laughed and laughed at how bad it was. I think I played it over and over again about four times. It was suddenly like it was an Ed Wood movie of sorts. So terrible that it was awesome! I think this odd outburst from me over "My Mammy" gave my mother enough of the 45s and she left them with me and went on to other things. Thing is, twenty years later, I still have that record and I often put it in my jukebox and play it and think about my mother and how much she always tried with me and how good she always was. I still think it's a terrible song, but its one of my most prized possessions in the world. My first memory of 45's was at the age of 3. When I was small, I was sick a lot from what the doctor called glandular fever. I'd be fine one minute and running a 105 temp. the next. I spent much time on the sofa. One of these times, my dad brought home a wood RCA Victor 45 rpm record player (1 repair in 52 years and still plays/looks great) and some 45's for me to play. These 45's were fairy tales put to music and voice. There were at least 2 stories on each side, making it 4 stories for the whole 45. Stories such as Goldilocks and the Three Bears, Little Red Riding Hood, Chicken Licken, The Ugly Duckling, etc. Since there were no books accompanying these 45's as in latter days, my full attention was on listening to the words (a great tool for later life use). 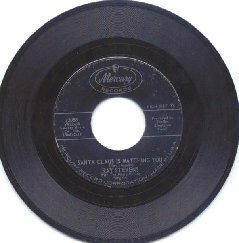 The first two 45's I remember asking my parents' to buy for me (at the age of 9 --- 1961) were: Roses are Red by Bobby Vinton and A Little Bitty Tear by Burl Ives. 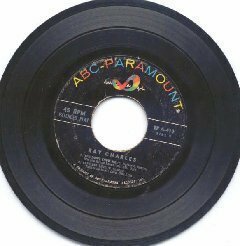 The first 45 I bought ( age 13 -- 1965) with my own money was Days of Wine and Roses for the sale price of 10 cents. I Wonder Why ... by Dion & The Belmonts ... Summer of '58. Ya, I still got it! Dave S.